Your device is way too small to view our website! Please use a newer mobile device or desktop to shop our website. If you do not have access to one of these, you can contact us to place an order at 800-504-5989 M-F 8am-5pm CST, or sales@hardwood-cleaner-resources.com. 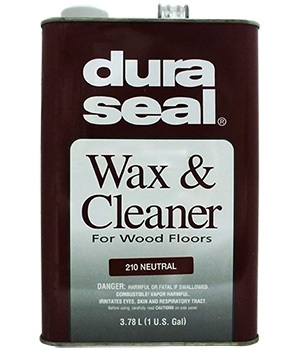 Dura Seal Hardwood Wax and Floor Cleaner blends cleaning agents and wax together fast, thorough floor maintenance. This floor cleaner is made for use on hardwood wax finished floors. Dura Seal's special formula is designed to remove scuff marks and built up dirt. You will also get a durable wax that polishes and adds a soft sheen to your wood floors. This hardwood wax and floor cleaner is a neutral, lighter finish. This same great formula is also available in Coffee Brown for darker finishes. You'll love the finished look you get with this all in one cleaner and wax treatment. One gallon of Dura Seal hardwood wax and cleaner will cover approximately 500 square feet. Looking for more Dura Seal products for your floors? Try Dura Seal Renovator to clean and reseal your hardwood floors that have been previously finished with Dura Seal products. We also carry the Dura Seal 32oz Hardwood Cleaner for your non-wax finished hardwood floors. Helpful Tips for Maintaining Your Hardwood Floors. Using the correct cleaning product will extend the life of your floor. Order today. This product contains V.O.C. Some states have regulations as to the levels of V.O.C. products can contain. Due to these regulations Duraseal Hardwood Neutral Wax and Cleaner can not be shipped to the following states: California, Connecticut, Delaware, District of Colombia, Illinois, Indiana, Maine, Maryland, Massachusetts, New Jersey, New York, Ohio, Pennsylvania, Rhode Island, and Virginia.